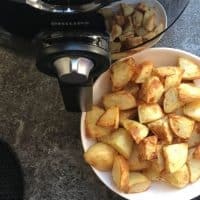 Home » Recipes » Air Fryer Recipes » Simply The Best Air Fryer Roast Potatoes! 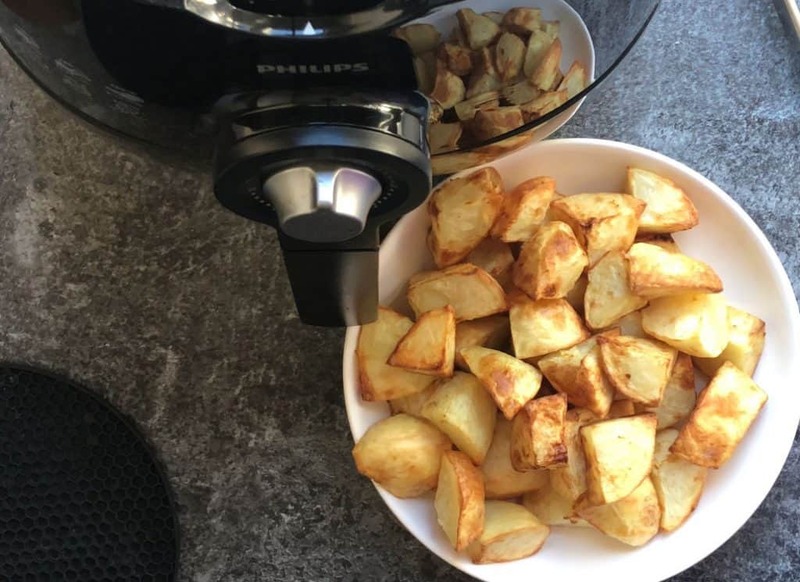 Simply The Best Air Fryer Roast Potatoes! Roast potatoes are our weekly treat to have alongside our Sunday roast. We always do them in the oven, which if I’m honest, takes forever. Admittedly we do have a bit of an ancient oven which likely isn’t the most efficient. So, I was really keen to see if we could make tasty roast potatoes in the air fryer. I knew I had less space to play with, and I also wanted to use as little oil as possible; without losing out on the lovely crispy on the outside, soft on the inside, roast potatoes we are used to. I made these in a Philips Air Fryer, so one of the smaller air fryers. And I needed to make enough to feed 4 people (2 adults and 2 children). I used 2 medium sized potatoes per person (Maris Piper), so 8 in total. I used just 1 tbsp of olive oil which was enough to crisp them up to taste like the roasties we know and love! 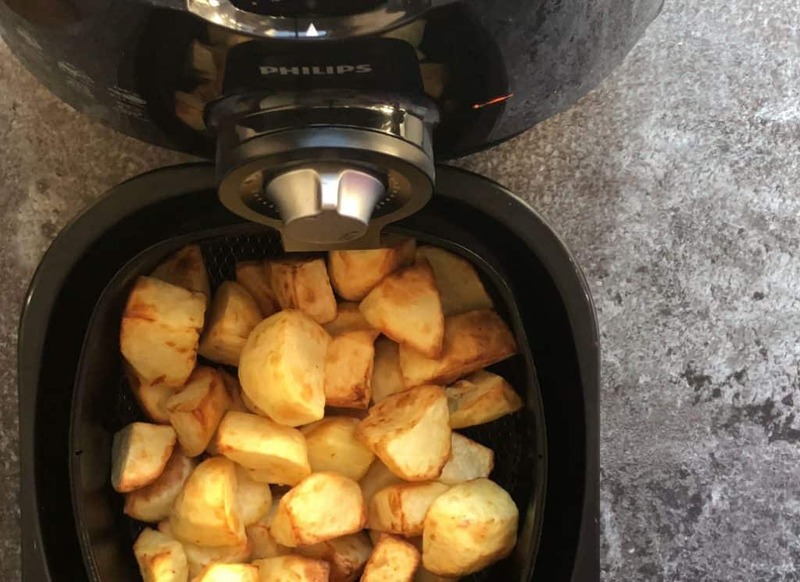 The key to making these work in the air fryer, particularly a smaller sized air fryer, is making really small potatoes. This helps us to fit more in as well as ensure they cook quickly enough. You can make larger potatoes, but you will need to increase the cook time. I cooked these at 180C/350F for 25 minutes. 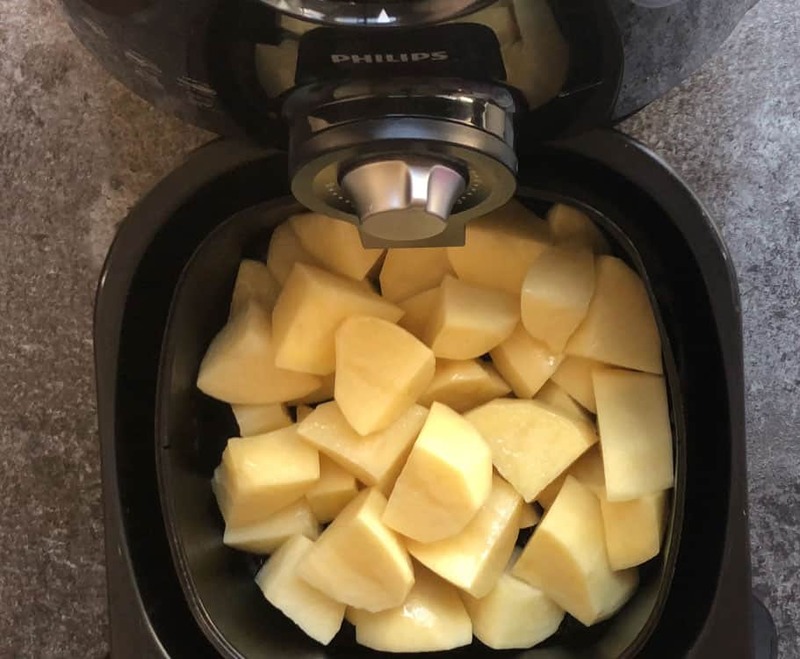 Depending on your air fryer, and what size you cut your potatoes, you will might need to adjust the time. As always, check on them at regular intervals to see how quickly they are cooking. Also, make sure you give them a little shake at various intervals to move them about in the basket a bit. Did you like this recipe? Do you want some more? If so, please head over to my Air Fryer page on Facebook where I share some more recipes. Peel and chop up potatoes. The smaller you cut them up the quicker they will cook. Spray/brush with 1tbsp of oil - make sure they are all coated. Put potatoes in air fryer basket and slide into the air fryer. Cook for 25 minutes. Check on them at regular intervals and give them a good shake about.